Spanish filmmaker Pedro Almodovar’s 1988 black comedy Women on the Verge of a Nervous Breakdown would seem a dubious choice to become a big Broadway musical. Yet that is what happened in 2010 when playwright Jeffrey Lane and composer/lyricist David Yazbek premiered their adaptation at Lincoln Center. It confused audiences and critics alike (the New York Times’s Ben Brantley didn’t seem to have a clue what was happening or why). 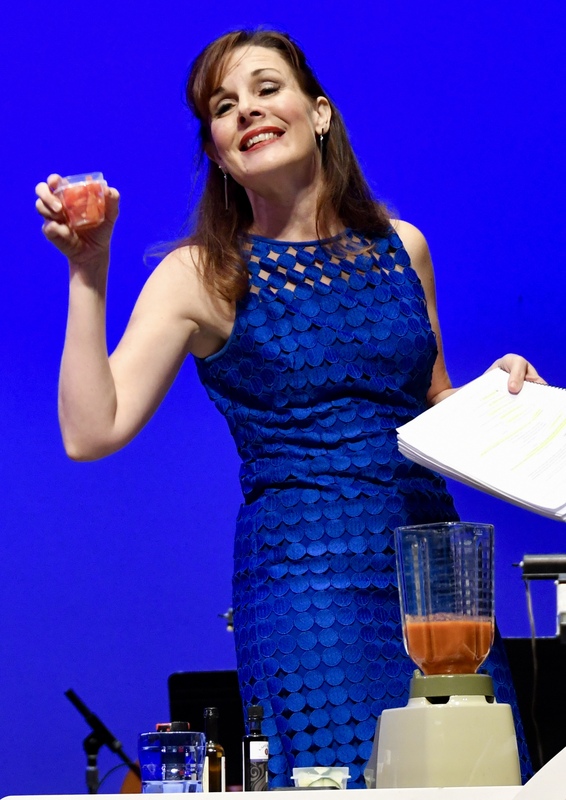 The show only lasted a total of 69 performances even with a cast headed by Tony Award winners Patti Lupone, Brian Stokes Mitchell and Laura Benanti. The problem may have started with its poorly translated title for English speaking audiences. The actual Spanish title refers to an ataque de nervios, which is not actually well translated as “nervous breakdown”. Ataques de nervios are culture-bound psychological phenomena during which the individual, most often female, displays a dramatic outpouring of negative emotions, bodily gestures, occasional falling to the ground, and fainting, often in response to receiving disturbing news or witnessing or participating in an upsetting event. Historically, this condition has been associated with hysteria more recently in the scientific literature with post-traumatic stress and panic attacks. That seems more like what is affecting Pepa and the other women in 1987 Madrid. Pepa, an actress recognized for her commercials, is desperately trying to connect with her longtime lover Ivan who seems to be avoiding her of late. Ivan definitely is for several reasons. He is breaking up with Pepa because he has a new lover, the lawyer Paulina. Paulina is conflicted because she is representing Ivan’s wife Lucia who is suing Ivan for her lost years after being in an asylum for the past twenty. Lucia’s son Carlos is engaged to marry the virgin Marisa but both are having second thoughts. Pepa’s best friend Candela has the biggest reason to be nervous: her current lover turns out to be a Muslim terrorist whose face is all over the television news. These women all converge during a very nerve wracking day featuring fainting, valium-laced gazpacho, taxi cab pursuits and gunfire. 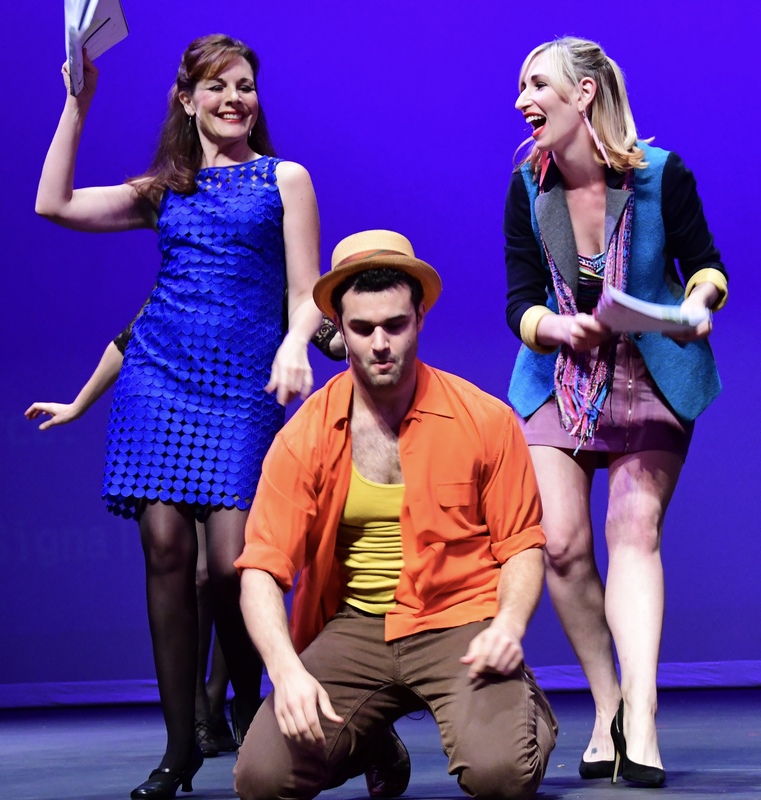 It’s a fun outing in the stripped down staged concert version that Musical Theatre Guild presented on November 12 at the Alex Theatre under the spirited and focused direction of Richard Israel. As usual, MTG’s cast contained probably the best assembly of singing voices possible. 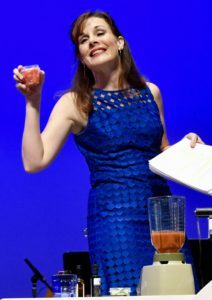 Kim Huber excelled as Pepa, confidently handling the dramatic arc of her story, displaying spot on comic timing and a flawless singing voice. 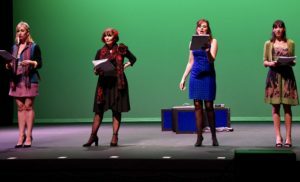 Eileen Barnett channeled her inner Patti Lupone diva as the overbearing Lucia and Nikka Graff Lanzarone brought down the house with her comic characterization of the truly manic Candela; her “Model Behavior” was inspired lunacy. Those three, along with Tayler Mettra as Marisa, united for the stellar Act One closer “On the Verge”. Travis Leland displayed a cool crooner tone as the Taxi Driver who weaves all the various characters and stories into a cohesive whole. Good support was given by Jill Marie Burke as Paulina, Rodrigo Varandas as Carlos and Robert Yacko as Ivan. Musical director Corey Hirsch led the five-piece band from behind the keyboards. Women on the Verge of a Nervous Breakdown was a prime example of what Musical Theatre Guild does best–present shows that have rarely or never been seen on local stages and prove that their musicality deserves a second look and listen.